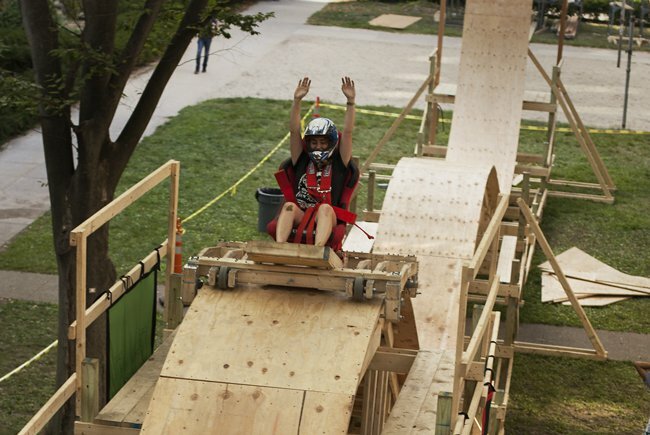 After months of planning and a week of skillful building, the student-built rollercoaster in MIT’s East Campus has been completed and is now offering rides to any and all brave individuals of the general public. The construction of the rollercoaster was lead by Formlabs’ very own summer intern, Ben Katz, who took advantage of high resolution 3D printing on the Form 1+ to build a 1:60 scale model of the coaster. While the 60 hours of collective print time it took to print the scale model is certainly impressive, Katz revealed that he spent over 16 hours a day for a week with a handful of other MIT students, building the full scale, rideable version of the roller coaster. The roller coaster will be up until next week, so be sure to check out the amazing structure for yourself!